The world faces a technology workforce crisis. 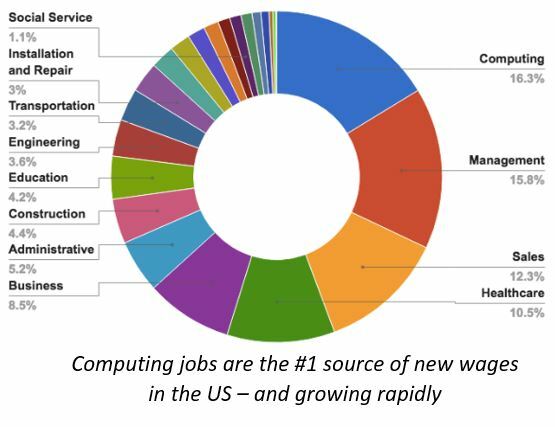 In the US alone, there are currently 500,000 open positions for computer science jobs, a number which is ten times the number of new computer science graduates and which is growing at twice the rate of other jobs. 90% of parents want their kids to learn computer science, yet only 40% of schools teach it. This means many computing jobs go unfilled, slowing potential high tech sector growth. To solve this, we need to find a better way to encourage students to learn computer science. Experts agree: the earlier kids start learning computer science, the better. Computer is being rapidly recognized as a core STEM skill set that should be introduced at an early age – some say exposure should begin as early as kindergarten. Early exposure not only helps with subject mastery, but with motivation as well. In general, kids that learn computer science by high school are 6 times more likely to major in it in college. It is especially important for girls, who are 10 times more likely to major in computer science if they learn it by high school. 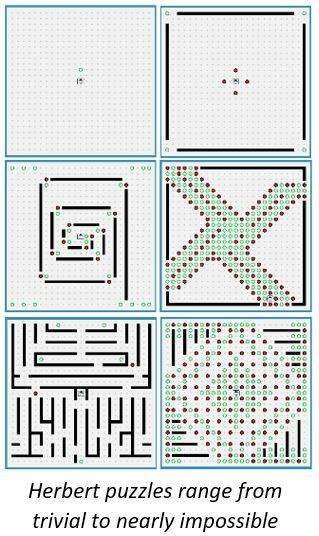 To learn computer science at such a young age, you need an engaging, graphical, gamified teaching and quantitative assessment tool that starts with problems and techniques that anyone can learn. Herbert has been successfully used with kids as young as five, where by the end of the first lesson they were already making their own simple programs. Herbert is unique in that it grows with students, by gradually introducing new programming techniques and by its library of over 3000 puzzles which range from trivial to virtually impossible. Herbert starts by teaching basic statements, but incrementally teaches more advanced techniques like functions, parameters, recursion, objects, methods, and optimization. It is easy enough for young kids to learn, yet can also be hard enough to stump the best programmers in the world. Microsoft used Herbert for many years in its Imagine Cup worldwide college competition as a way to challenge its competitors and ultimately to select the top 6 finalists from a starting field of over 40,000. What’s more, Herbert provides educators with quantitative assessments of students at each step of the way, tracking exactly where each student is in their learning curve and in what areas they still need to gain proficiency. In the end, Herbert does more than teach students how to code – it engages students in ongoing competitions and connects them with companies looking to hire. Its assessment scores provide a standard way for students to prove their abilities, regardless of their gender, ethnicity, background, environment, school, or curriculum. Herbert truly helps open the doors of the computing job market to all.